Gregg Behrens established this scholarship in the hope that it will support future members of Alpha Tau Zeta in pursuing their dreams and achieving their full potential. Gregg, AT 552, gained much from his Iowa State experience, both in the classroom and through campus and Lambda Chi activities. Establishing this scholarship is one of several ways that he shows his support of Iowa State University and the ideals and principals of Lambda Chi Alpha. He encourages recipients of this scholarship to do the same when they are able. 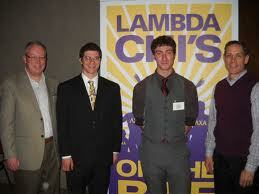 One of the recent scholarship winners is shown below with Brother Gregg Behrens. 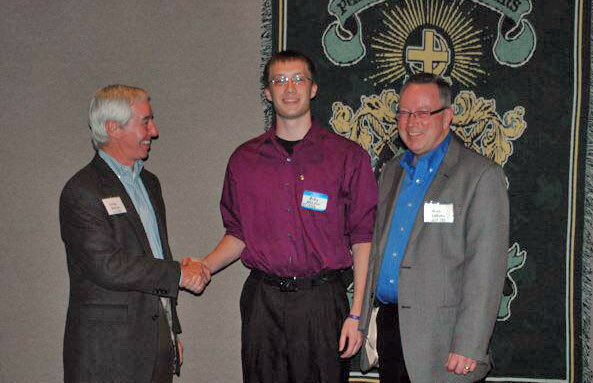 Gregg Behrens, left, and Steve Lubahn, right, presenting the scholarship to Andy Meyer, center, winner of the 2011 Gregg & Ann Behrens Scholarship.